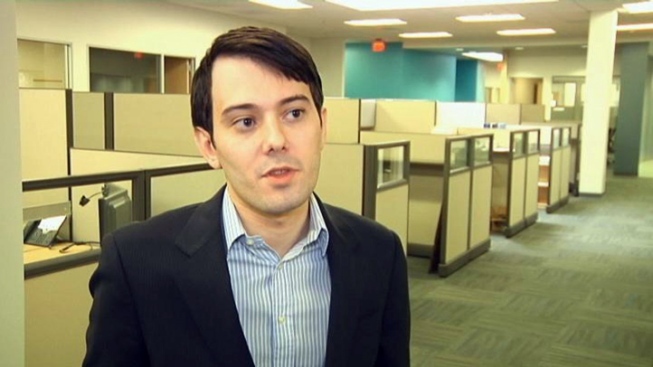 Martin Shkreli, ousted CEO of San Francisco’s KaloBios, is seen inside company headquarters in this November 2015 file photo. One of the biotech companies run by Martin Shkreli, the reviled drug price-gouger charged with securities fraud last week, was informed Wednesday that its stock will be delisted by Nasdaq because of Shkreli's arrest and other issues. Meanwhile, KaloBios Pharmaceuticals Inc. also is dealing with the abrupt resignation of its accounting firm and a void left by its firing of Shkreli. KaloBios was running out of money and planning to suspend its research programs and shut down operations in November. That's when Shkreli, the CEO of Turing Pharmaceuticals Inc., swooped in and gained controlling interest of KaloBios stock. Shkreli was immediately named chief executive officer and chairman of the board of the South San Francisco, California, drug developer. In a statement Wednesday, KaloBios said that Nasdaq wrote that it will be removed from trading on Dec. 30 if KaloBios doesn't appeal. The company has not yet decided whether it will appeal. Nasdaq cited reasons for the delisting including the indictment and arrest of both Shkreli and an outside attorney for KaloBios, Evan Greebel, plus the company's noncompliance with Nasdaq financial reporting rules. KaloBios has not filed with the U.S. Securities and Exchange Commission a report on its financial results for the three months ended Sept. 30, as publicly traded companies are required to do every three months. Shkreli became notorious after hiking the price of Daraprim, the only approved drug for toxoplasmosis, a rare and sometimes deadly parasitic infection, by 5,000 percent — from $13.50 to $750 per pill. Shkreli has been deluged with criticism from patients, politicians and others since hiking Daraprim's price late in the summer, shortly after the U.S. rights to sell it were bought by Turing, a biotech company Shkreli founded last year. Last Thursday, Shkreli, a 32-year-old former hedge fund manager, was arrested in New York and charged with securities fraud and conspiracy related to a pharmaceutical company he previously ran called Retrophin. Federal prosecutors allege that from 2009 to 2014, Shkreli made bad trades that lost money of some investors in his hedge fund, MSMB Capital Management. Prosecutors say he then looted Retrophin for $11 million to pay back his disgruntled clients. Shkreli has pleaded not guilty and said that he was targeted for increasing Daraprim's price. He was released on $5 million bail Thursday. Greebel was charged with conspiracy and also pleaded not guilty. The two men face similar allegations in a civil complaint filed by the SEC. KaloBios fired Shkreli as CEO and he resigned from its board on Thursday, though the company didn't announce that until Monday. Also Monday, its independent registered public accounting firm, Marcum LLP, resigned as the independent accounting firm for KaloBios, less than two weeks after being retained on Dec. 8. KaloBios has not announced who will serve as CEO and board chairman, and it hasn't responded to questions on the subject by The Associated Press. Its stock hasn't traded since last Wednesday, when shares closed at $23.59. Shkreli resigned on Friday as CEO of Turing, which has offices in New York and Zug, Switzerland.